In this tutorial, we will look at how to deal with rendering multiple objects, as well as what happens when multiple objects overlap. The first step in looking at what happens when objects overlap is to draw more than one object. This is an opportunity to talk about a concept that will be useful in the future. An object, in terms of what you draw, can be considered the results of a single drawing call. Thus, an object is the smallest series of triangles that you draw with a single set of program object state. Use glEnableVertexAttribArray to enable this attribute. Use glBindBuffer(GL_ARRAY_BUFFER) to bind to the context the buffer object that contains the data for this attribute. Use glVertexAttribPointer to define the format of the data for the attribute within the buffer object previously bound to GL_ARRAY_BUFFER. The more attributes you have, the more work you need to do for each object. To alleviate this burden, OpenGL provides an object that stores all of the state needed for rendering: the Vertex Array Object (VAO). VAOs are created with the glGenVertexArray function. This works like glGenBuffers (and like most other OpenGL objects); you can create multiple objects with one call. As before, the objects are GLuints. VAOs are bound to the context with glBindVertexArray; this function does not take a target the way that glBindBuffer does. It only takes the VAO to bind to the context. This creates a single VAO, which contains the vertex array state that we have been setting. This means that we have been changing the state of a VAO in all of the tutorials. We just did not talk about it at the time. The following functions change VAO state. Therefore, if no VAO is bound to the context (if you call glBindVertexArray(0) or you do not bind a VAO at all), all of these functions, except as noted, will fail. glVertexAttribPointer. Also glVertexAttribIPointer, but we have not talked about that one yet. glBindBuffer(GL_ELEMENT_ARRAY_BUFFER): Calling this without a VAO bound will not fail. You may notice that glBindBuffer(GL_ARRAY_BUFFER) is not on that list, even though it is part of the attribute setup for rendering. The binding to GL_ARRAY_BUFFER is not part of a VAO because the association between a buffer object and a vertex attribute does not happen when you call glBindBuffer(GL_ARRAY_BUFFER). This association happens when you call glVertexAttribPointer. When you call glVertexAttribPointer, OpenGL takes whatever buffer is at the moment of this call bound to GL_ARRAY_BUFFER and associates it with the given vertex attribute. Think of the GL_ARRAY_BUFFER binding as a global pointer that glVertexAttribPointer reads. So you are free to bind whatever you want or nothing at all to GL_ARRAY_BUFFER after making a glVertexAttribPointer call; it will affect nothing in the final rendering. So VAOs do store which buffer objects are associated with which attributes; but they do not store the GL_ARRAY_BUFFER binding itself. If you want to know why glVertexAttribPointer does not simply take a buffer object rather than requiring this bind+call mechanism, it is again because of legacy API cruft. When buffer objects were first introduced, they were designed to impact the API as little as possible. So the old glVertexAttribPointer simply changed its behavior depending on whether something was bound to GL_ARRAY_BUFFER or not. Nowadays, since this function will fail if nothing is bound to GL_ARRAY_BUFFER, it is simply an annoyance. This allows you to setup a VAO early on, during initialization, and then simply bind it and call a rendering function to draw your object. Be advised when using a VAO in this way: VAOs are not immutable. Calling any of the above functions will change the data stored in the VAO. In the last tutorial, we drew a rectangular prism. If you looked carefully at the vertex data, you may have noticed that a lot of vertex data was frequently repeated. To draw one face of the cube, we were required to have 6 vertices; the two shared vertices (along the shared line between the two triangles) had to be in the buffer object twice. For a simple case like ours, this is only a minor increase in the size of the vertex data. The compact form of the vertex data could be 4 vertices per face, or 24 vertices total, while the expanded version we used took 36 total vertices. However, when looking at real meshes, like human-like characters and so forth that have thousands if not millions of vertices, sharing vertices becomes a major benefit in both performance and memory size. Removing duplicate data can shrink the size of the vertex data by 2x or greater in many cases. This defines how array drawing works. You start with a particular index into the buffers, defined by the start parameter, and proceed forward by count vertices. In order to share attribute data between multiple triangles, we need some way to random-access the attribute arrays, rather than sequentially accessing them. This is done with an element array, also known as an index array. 12 vertices, which generate 4 triangles. There is only one element array, and the indices fetched from the array are used for all attributes of the vertex arrays. So you cannot have an element array for positions and a separate one for colors; they all have to use the same element array. This means that there can and often will be some duplication within a particular attribute array. For example, in order to have solid face colors, we will still have to replicate the color for every position of that triangle. And corner positions that are shared between two triangles that have different colors will still have to be duplicated in different vertices. It turns out that, for most meshes, duplication of this sort is fairly rare. Most meshes are smooth across their surface, so different attributes do not generally pop from location to location. Shared edges typically use the same attributes for both triangles along the edges. The simple cubes and the like that we use are one of the few cases where a per-attribute index would have a significant benefit. Now that we understand how indexed drawing works, we need to know how to set it up in OpenGL. Indexed drawing requires two things: a properly-constructed element array and using a new drawing command to do the indexed drawing. Element arrays, as you might guess, are stored in buffer objects. They have a special buffer object binding point, GL_ELEMENT_ARRAY_BUFFER. You can use this buffer binding point for normal maintenance of a buffer object (allocating memory with glBufferData, etc), just like GL_ARRAY_BUFFER. But it also has a special meaning to OpenGL: indexed drawing is only possible when a buffer object is bound to this binding point, and the element array comes from this buffer object. 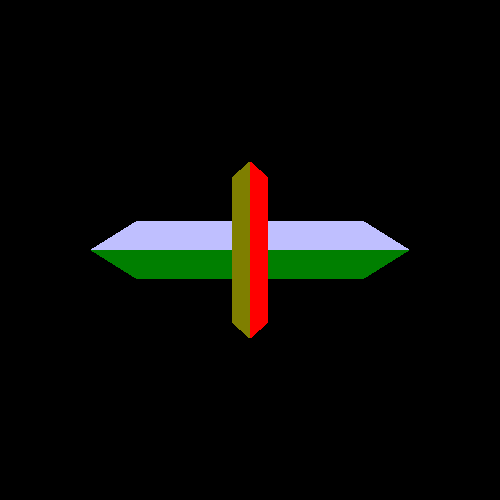 All buffer objects in OpenGL are the same, regardless of what target they are bound to; buffer objects can be bound to multiple targets. So it is perfectly legal to use the same buffer object to store vertex attributes and element arrays (and, FYI, any data for any other use of buffer objects that exists in OpenGL). Obviously, the different data would be in separate regions of the buffer. In order to do indexed drawing, we must bind the buffer to GL_ELEMENT_ARRAY_BUFFER and then call glDrawElements. The first parameter is the same as the first parameter of glDrawArrays. The count parameter defines how many indices will be pulled from the element array. The type field defines what the basic type of the indices in the element array are. For example, if the indices are stored as 16-bit unsigned shorts (GLushort), then this field should be GL_UNSIGNED_SHORT. This allows the user the freedom to use whatever size of index they want. GL_UNSIGNED_BYTE and GL_UNSIGNED_INT (32-bit) are also allowed; indices must be unsigned. The last parameter is the byte-offset into the element array at which the index data begins. Index data (and vertex data, for that matter) should always be aligned to its size. So if we are using 16-bit unsigned shorts for indices, then indices should be an even number. The elementArray represents the buffer object bound to GL_ELEMENT_ARRAY_BUFFER. The tutorial project Overlap No Depth uses VAOs to draw two separate objects. These objects are rendered using indexed drawing. The setup for this shows one way to have the attribute data for multiple objects stored in a single buffer. For this tutorial, we will be drawing two objects. They are both wedges, with the sharp end facing the viewer. The difference between them is that one is horizontal and the other is vertical on the screen. The shaders are essentially unchanged from before. We are using the perspective matrix shader from the last tutorial, with modifications to preserve the aspect ratio of the scene. The only difference is the pre-camera offset value; in this tutorial, it is a full 3D vector, which allows us to position each wedge in the scene. //Use the same buffer object previously bound to GL_ARRAY_BUFFER. This code looks complicated, but it is really just the rendering code we have seen before. The offset computations for the glVertexAttribPointer calls are more complex, due to having the data for 2 objects stored in a single buffer. But overall it is the same code. The code generates 2 VAOs, binds them, then sets their state. Recall that, while the GL_ARRAY_BUFFER binding is not part of the VAOs state, the GL_ELEMENT_ARRAY_BUFFER binding is part of that state. So these VAOs store the attribute array data and the element buffer data; everything necessary to render each object except for the actual drawing call. In this case, both objects use the same element buffer. However, since the element buffer binding is part of the VAO state, it must be set into each VAO individually. Notice that we only set the GL_ARRAY_BUFFER binding once, but the GL_ELEMENT_ARRAY_BUFFER is set for each VAO. If you look at the vertex position attribute in our array, we have a 3-component position vector. But the shader still uses a vec4. This works because OpenGL will fill in any missing vertex attribute components that the shader looks for but the attribute array doesn't provide. It fills them in with zeros, except for the fourth component, which is filled in with a 1.0. We bind a VAO, set its uniform data (in this case, to position the object properly), and then we draw it with a call to glDrawElements. This step is repeated for the second object. The two objects are essentially flipped versions of the same one, a wedge. One object appears smaller than the other because it is farther away, in terms of its Z distance to the camera. We are using a perspective transform, so it make sense that more distant objects appear smaller. However, if the smaller object is behind the larger one, why is it rendered on top of the one in front? Before we solve this mystery, there is one minor issue we should cover first.